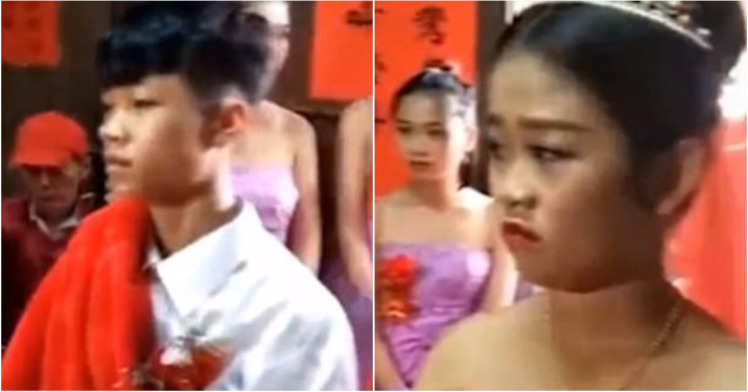 A video has emerged showing two children getting married in a ceremony in a Chinese village. According to Metro UK, they are both just 13 years old and the girl was five months pregnant at the time of the ceremony in Ding’an County, Hainan Province. The wedding, which is believed to have happened last month, has sparked anger in China but cannot be officially recognised because they are too young. The legal age for women to get married is 20 and for men it is 22 but child marriage is ‘common’ in rural China. However, the Beijing News reports that the ceremony was arranged by their family and they were happy to see them get married. A user of Weibo – China’s answer to Twitter – wrote: ‘They are still children. How could they shoulder their responsibilities in the future?’, according to Mail Online. Child marriage is a large problem in China and often happens when their parents leave them behind to go and work in cities, sometimes thousands of miles away, according to Xinhua. As a result they are cared for by their grandparents and often lack sexual education.